From the beginning of a journey to long after arriving home, travel can be one of the most rewarding adventures a family can have together. 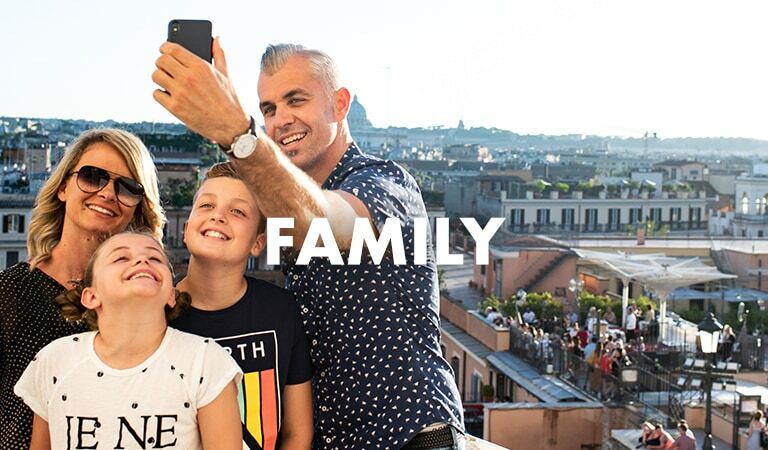 While travel enables families to form a stronger bond, children also benefit from the new experiences it brings and adults gain a greater appreciation for the world around them. With all the logistics and must-do experiences covered, the only thing you need to worry about is having fun, making memories and connecting with each other and the word, wherever you choose to explore. It’s the real thing, without worrying about a thing. Rediscover the joy of travelling with the whole family and make memories that will last beyond the adventure. Become a gladiator, explore castles or wander the outback – cowboy-style. Our real Trafalgar experiences offer plenty of ‘pinch me’ moments for the whole family. Our expert Travel Directors and Local Specialists are the perfect travel companions, unlocking the magic of travel for everyone to learn and discover the places we go. Expect quality stays, luxury transport with Wi-Fi in most countries and plenty of meals included (meaning a whole lot of full tummies and happy faces). Our Family trips are especially exciting for our young travelers – it's not every day that you get to ride a covered wagon to dinner or be part of a cowboy show! Trafalgar really helps bring the iconic American Wild West to life. The best experience is seeing the reaction of younger guests; seeing their eyes opening at the wonderment of the world and knowing that this is the beginning of their travel adventures. It’s always memorable. On one of my Castle and Kilts Family Experience trips, I gave each of my younger guests a turn at being ‘Travel Director for the day’. They were given a topic, they prepared the night before and then were able to talk on the mic in front of the group. They got points for outright lies! Some of the talks were the funniest moment of the trip. Whether your family is seeking action packed adventures or voyages of discovery, these family travel destinations will thrill and delight aspirational explorers of all ages.